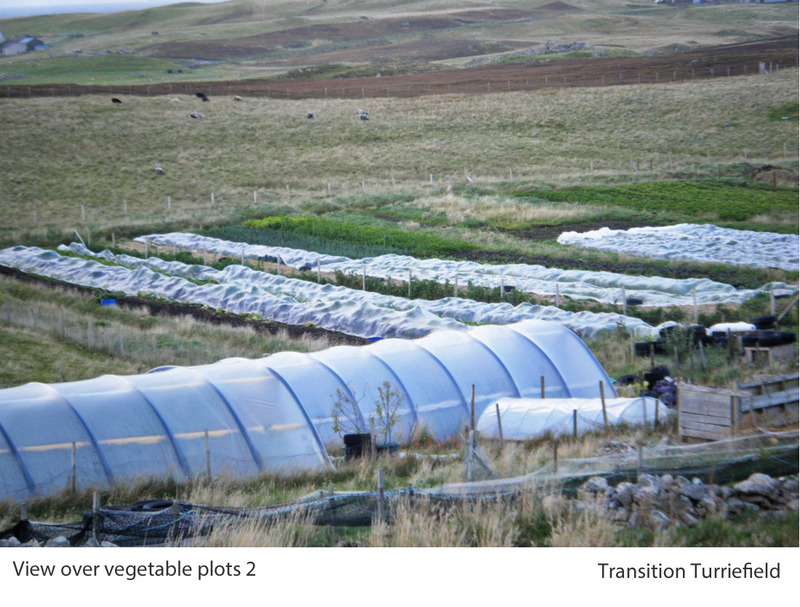 Transition Turriefield was set up in 2011 as a community run growing project, to provide locally produced fruit and vegetables in Shetland. 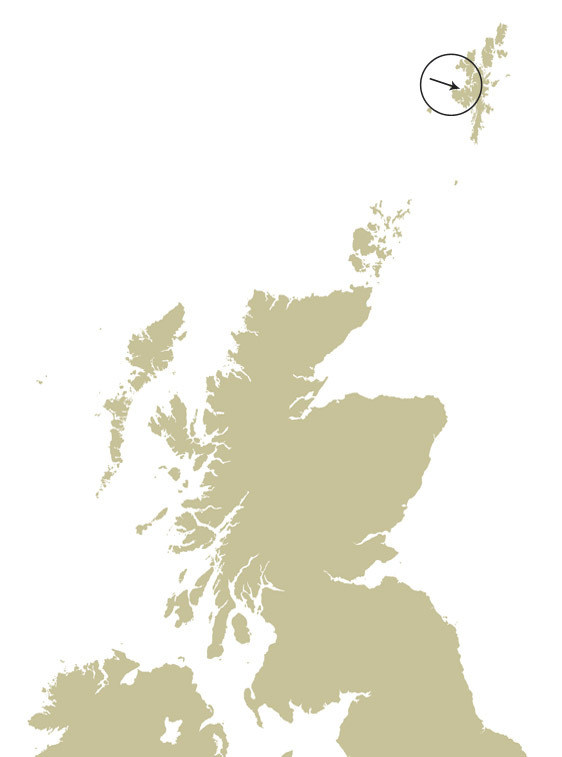 It was established to demonstrate a reduced fossil fuel approach to food production within the isles, to reduce Shetland’s food related carbon footprint, increase Shetland’s food security and ultimately to change the way Shetland thinks about importing food. Before the era of cheap oil and global food transportation, all Shetland crofts had a yard to grow crops. It was the only way to have fresh vegetables. 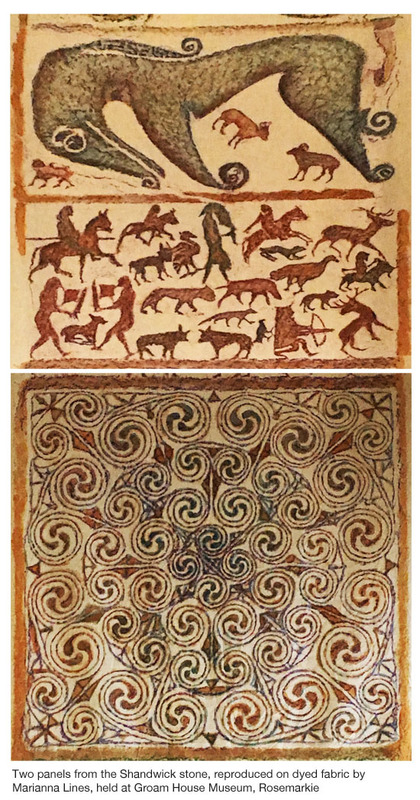 The most common produce grown, along with the cereals bere and oats, was Shetland kale, neeps and potatoes [see note below]. Produce was used as winter livestock feed, as well as supplementing the crofter’s diet of lamb and fish. These crops were hardy and coped well with the Shetland conditions. Nowadays yards can be seen all over Shetland, lying empty and unused. Tastes have changed and, along with the rest of the western world, Shetland residents expect more variety and an ‘out of season availability’ of produce that their grandparents could never have imagined. Regular ferry sailings and flights have made food available from all over the world, twelve months of the year, weather permitting. Encouraging island residents to consider reducing CO2 emissions, personal carbon footprints and make positive food buying choices is an uphill struggle. It is hampered by a belief by many that the alternative means a return to the kale and neep eating of the pre-1960s. Transition Turriefield has been determined to show local food production can provide better choice, fresher produce, reduce carbon footprints and be available even when bad weather prevents supplies arriving. From the beginning the project has focused on demonstrating that a wide range of produce can be grown in Shetland at market garden scale. Based on a small croft on the far west mainland, the challenges for economically sustainable food production are huge. The land is designated by the EU as a ‘severely disadvantaged Less Favoured Area’, of poor land quality and suitable only for rough grazing. The season is short, weather unpredictable and the climate extreme. None of which encourages bountiful crops. There is no doubt that kale and neeps are the easiest and most productive crops to grow. However, using innovation, along with experimentation to create micro-climates, and combining old fashioned farming methods with modern technology, more exotic produce has been made available to the community instead. Of the 21 hectares of land belonging to the croft, approximately 1.3 hectares are suitable for vegetable production. Just under 1 hectare is currently in production and includes 500 square metres of polytunnel space and 110 of raised beds as well as outside field space. The main growing area is at the lowest point of the croft. Soil here is either deep and peaty (drained bog) with clay patches, or shallow and stoney, with clay and low in organic matter. Soil nutrient analysis shows a pH of 6.3 with low phosphorus. Structurally the soil is compacted below the surface and low in oxygen due to the water content. Field drains and ditches have been put in and this has made a difference to the moisture content of the soil during the drier part of the season. As the land is worked season by season, effort is made to build soil and raise the growing area, improve structure, texture and nutrient content. Beds have been cleared using pigs and hand tools rather than machinery. Muck, seaweed, ash from peat and wood, compost, and loam from composted turf, are added each season in various combinations and quantities depending on type of crop to be grown in each bed. Digging is kept to a minimum and is limited to using forks to aerate topsoil and improve drainage where necessary. When beds are empty they are covered with black agricultural plastic, weighed down with old tyres, to reduce weeds, and lessen nutrient leaching from increasing rainfall. Use of the plastic is new as of January 2017 and has allowed an earlier and more rapid start to our sowing/planting season. Biodegradable, corn-starch based weed suppressant has also been used on experimental beds this season and has reduced weeding markedly. Using horse powered land-working equipment to reduce labour has been experimented with as part of the commitment to tackling climate change and reducing fossil fuel use. Strong horse working skills are required and it has taken time to learn methods and teach the horse too, but it does show potential. Unfortunately, the land has become markedly wetter over the last five years and is remaining so for longer periods. As yet it is unclear whether horse drawn equipment will be viable on the land without major soil improvements in the long term. Even with poor growing conditions Transition Turriefield perseveres with organic practice as an essential part of reducing fossil fuel use and protecting the environment. The project is not registered as organic due to the expense of ongoing registration and the impact of maintaining wider crofting practices in a rural and remote area. Access to organic animal feed for example, is not economically viable and accessing organic compost for seed sowing is an ongoing battle. Compromises too, have had to be made with fossil fuel reduction, for example where plastics are used for polytunnel covers and weed suppressants. Maintaining best practice, financial viability and sustainability will always be an ongoing balancing act. Crops are grown outside where possible, keeping the limited undercover space for the produce that really needs warmth and protection. During the short summer season aubergines, tomatoes, chillies, peppers, sweetcorn, pumpkins, courgettes, cucumbers and even melons can be grown undercover. By experimenting with sowing times and cultivars and using heat and light to start seeds off early, growing conditions can be manipulated to recreate suitable conditions and a long enough season. To achieve maximum production from the short summer season a strict sowing programme is used starting in January. Crops are sown in modules timetabled to enable plants to be ready to ‘hit the ground running’, once conditions are suitable for planting out either in the tunnels or outside. Celery and celeriac for example, are sown in the second week in February under lights and on heated mats at 18-20C, potted up, grown on and hardened off to allow planting out in the field by the 3rd week in May. Harvest begins in late September. Without additional heat and light, conditions would not be suitable for germination until April and the plants would not mature to a reasonable size before the growing conditions became unsuitable. A similar system and timing is used for aubergines, planted in tunnels and ready for harvest from mid-July onwards. Raised beds are used for some crops and are proving useful for manipulating conditions to increase productivity. Both garlic and parsnips have benefitted from the warmer, better drained soil in the beds. 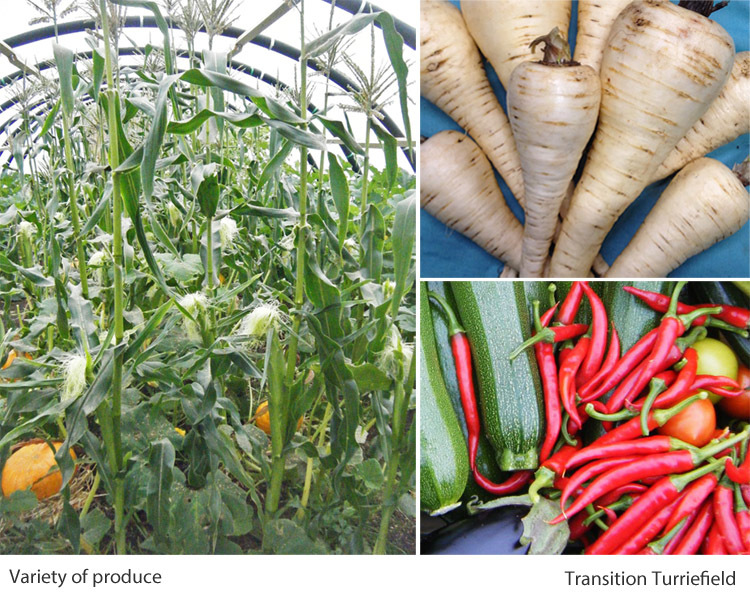 Mini tunnels are used to improve crop performance when needed. Garlic appreciates the extra heat to produce good sized bulbs unattainable in open ground. Experimenting with black plastic as an aid to warming raised beds from March onwards has enabled earlier sowings of parsnip and beetroot, with crops producing excellent sized roots. Sowing in the field cannot usually take place until end of May due to low soil temperature and waterlogging. Produce is sold through a veg box scheme, to rural community shops, a wholefood retailer in the main town of Lerwick and local hotels. 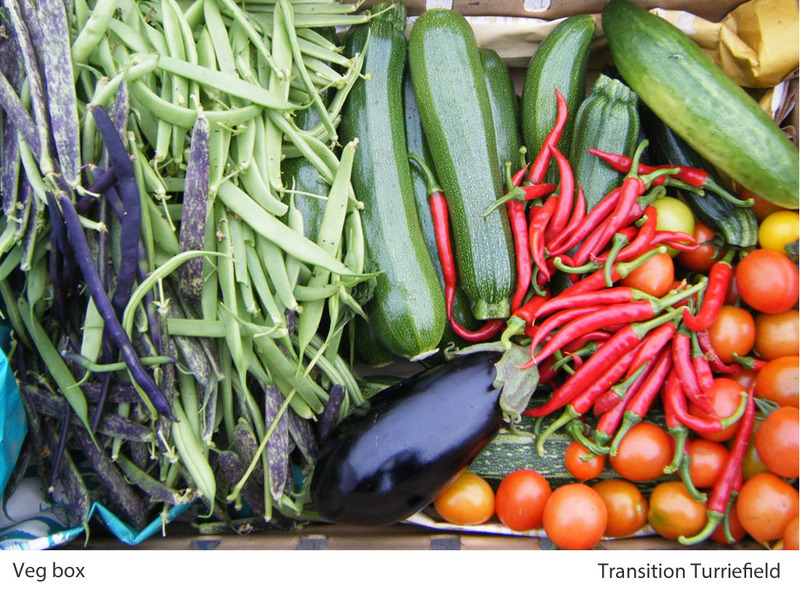 The veg box scheme operates using a Community Supported Agriculture model. Box customers commit to financial support of the project for a season as well as contributing voluntary hours to vegetable production. This has been a successful m ethod of encouraging community participation in local food production and raising awareness food related CO2 emissions. Additional income is generated through training courses and workshops sharing the learning and supporting others to grow their own. The project works with both children and adults; schools, community groups and the local authority to raise awareness of climate change and encourage carbon footprint reduction. The largest limiting factor for the project is the ability to grow enough produce on the site—to generate enough income to pay sufficient staff—to grow enough produce, and so on. These particular issues are no different to other, similar, small growing projects throughout the country. Though small the project already cultivates and brings to market a huge variety and quantity (10 tonne+) of crops each season. With further investment, soil improvement, increase protected growing and further experimentation, there is the potential to double the quantity of fresh produce for the Shetland community. Transition Turriefield is run by Penny Armstrong and Alan Robertson. Address: Transition Turriefield, Sandness, Shetland ZE2 9PL. Tel: 01595 870272. Web: www.turriefieldveg.co.uk. Facebook: www.facebook.com/turriefield. Note on crops for our overseas readers: bere is a landrace of barley, kale is a leaf vegetable member of the brassica family, and neeps is turnip or swede. 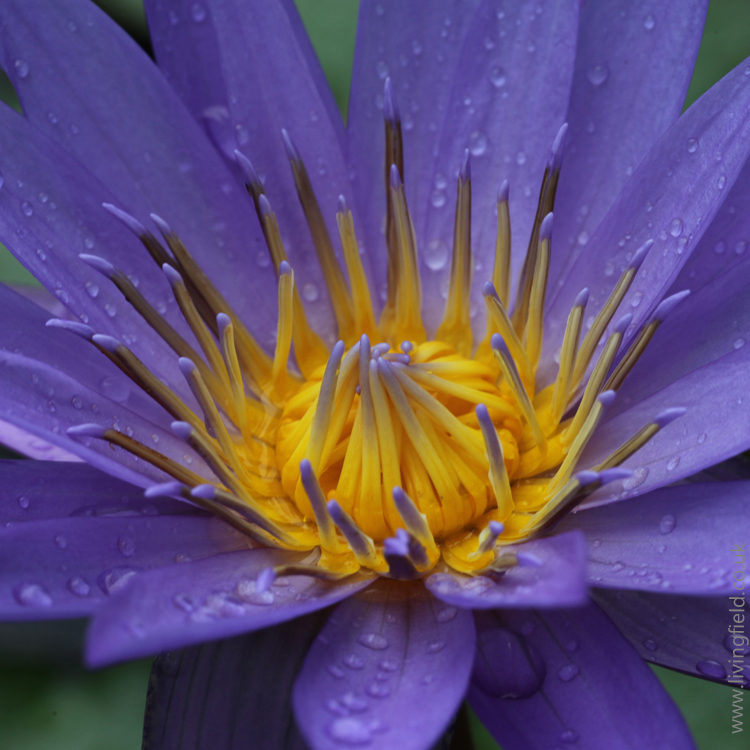 When in south east Asia …. …. the defining sights, textures and tastes of the region must include the vegetables and fruits that are on sale everywhere and form such a nutritious and tasteful part of the diet. 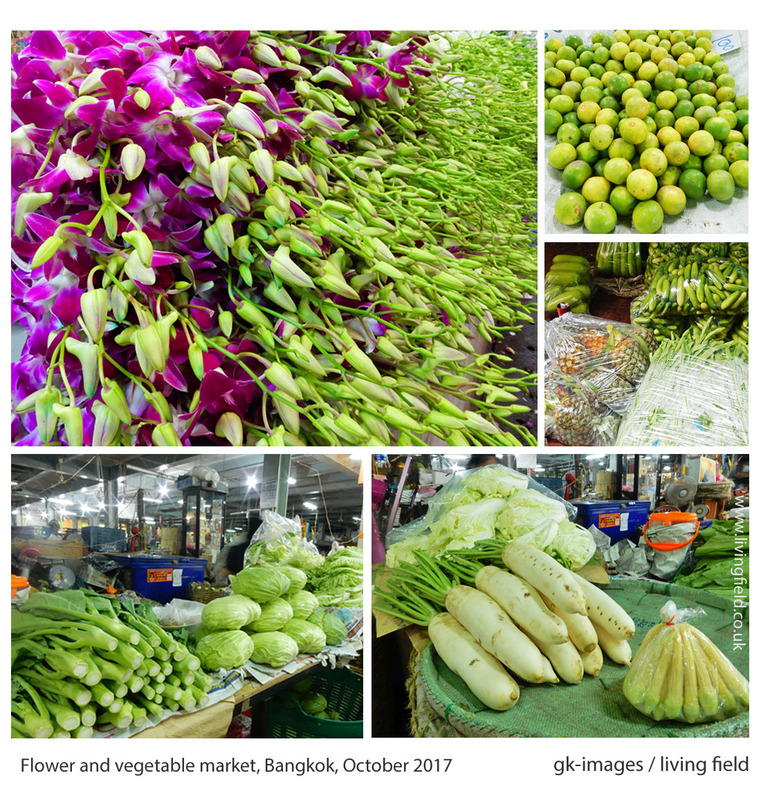 The humblest stalls and open-air cafes offer such a range of fresh plant products, boiled or fried, alone or with with rice or noodles, as are rarely found in Europe. Take kangkong – steeped in garlic and soy sauce, a low-cost pure vegetable delight with no equivalent here . Stalls everywhere sell pineapple, mango, lychee, papaya. In the season, durians and mangosteens, rambutans, custard apples and jack fruit offer unique tastes and textures . 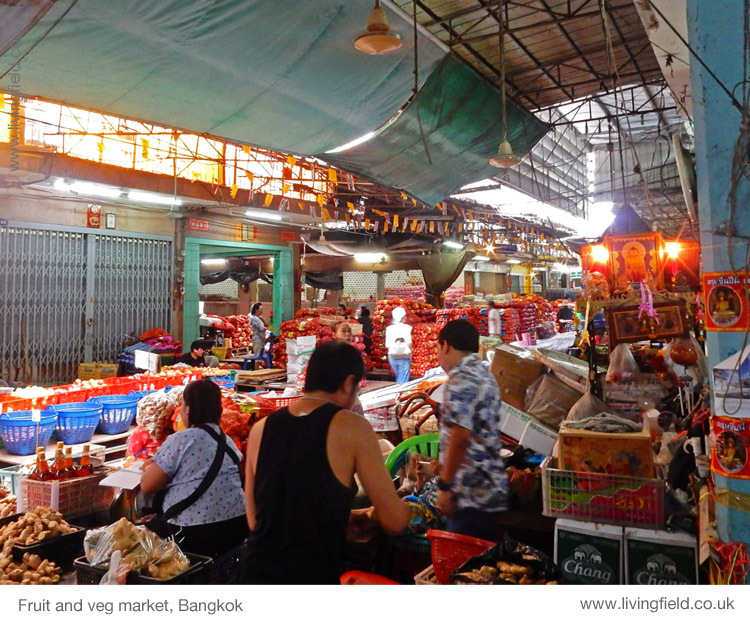 So a visit to the vegetable and fruit markets of Bangkok was not to be missed. The main flower market sells fresh flowers, fruits and vegetables. Above are a great bank of flowering orchids, for show, not to eat, limes (? top right), pineapples and courgettes, roots including very large ‘radishes’, and leaf vegetables. Most produce was bagged, or in the process of being, and taken away on bicycles, scooters and tuk-tuks, most likely on short supply chains to hotels, restaurants and cafes in the city. The bikes and scooters politely elbowed and wheeled their way through people. 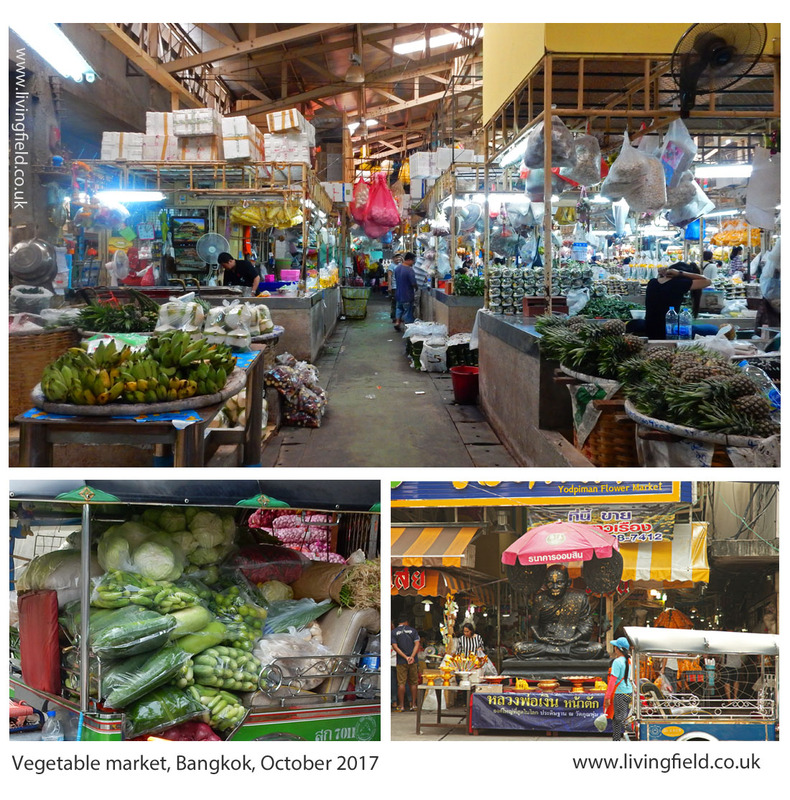 No small packets here – but great quantities of things: six-feet high banks of lemon grass (top left above), then ginger, chillies and spiny gourds. In Europe we are used to seeing and eating the yellow-skinned banana fruits. But here also the banana’s unopened flowering heads were for sale , destined for gourmet cook-shops. The produce covered the wide range of storage times found at good markets anywhere . Everything from leafy greens and herbs, high in vitamins and minerals, needing to be cooked and eaten within days before they go off, contrasting with the roots and tubers which, like our potato and swede, can last for weeks, months even, sustaining people and animals over bad times. 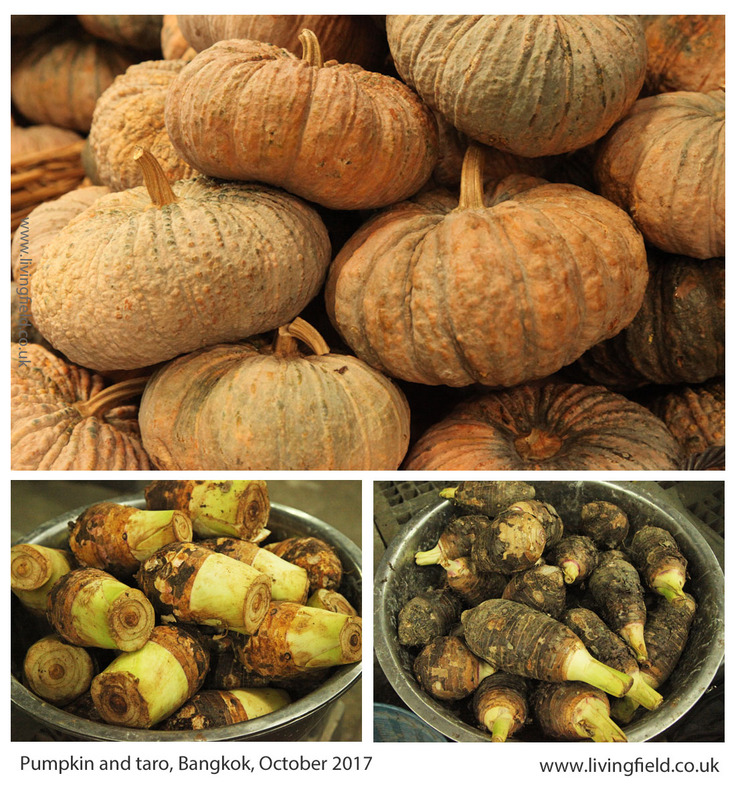 Of the longer lasting vegetables were taro  and various sorts of pumpkin. It was a busy place: many small traders, most everything visible. Food in, food out, quickly. Another world from the big retailers that most Europeans buy from. Kangkong or kangkung – is one of the simplest of dishes, made from the leafy shoots of various plants, the most common being Ipomoea aquatica. Laced with garlic, mild chillies and soy sauce, a culinary delight, served at the humblest of roadside cook shops. Of these fruits, the Durian, is the king, they say. It’s of the genus Durio, of which there are many species. There’s little point in a European trying to describe a durian. They have to be experienced. But don’t just try any one that you come across. Durian experts say – select not the first of the season, and not the northernmost, but bide your time, smell each one discerningly, and lingeringly … and blessings will be yours. 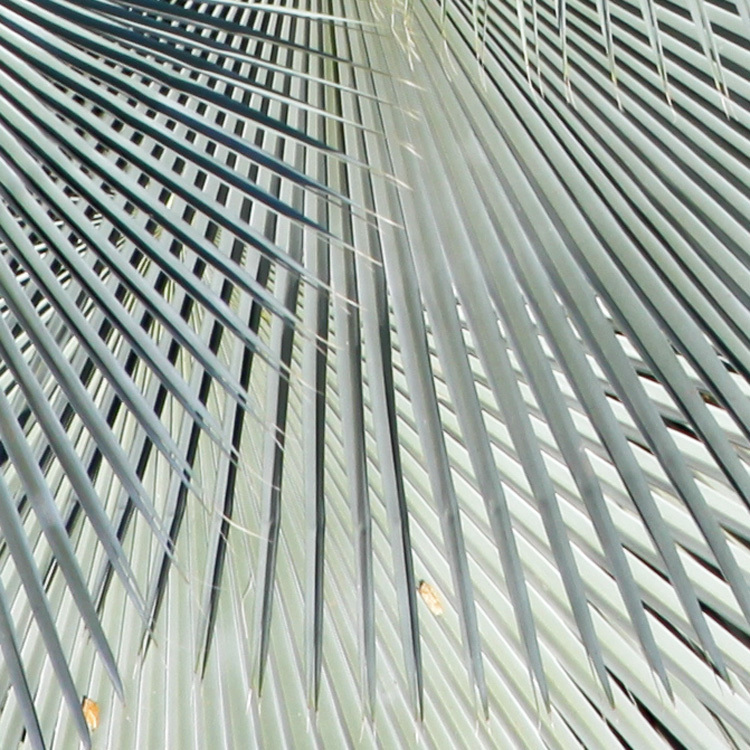 A bit arcane, this durian lore – but from experience, it seems to work. And they do say that people go to extremes over the best wild durians, keeping them under guard night and day while fruiting, until they are just right. Also the other fruits mentioned may be palate-changing – mangosteens and custard apples, for example – and don’t be put off by the outer appearance of the jackfruit, because inside it’s ….. delicious. The fruits of the plantation banana are well known here, but the large flower buds and flowers of assorted plantains including the commercial banana (all Musa species) are widely used in cooking in south-east Asia. 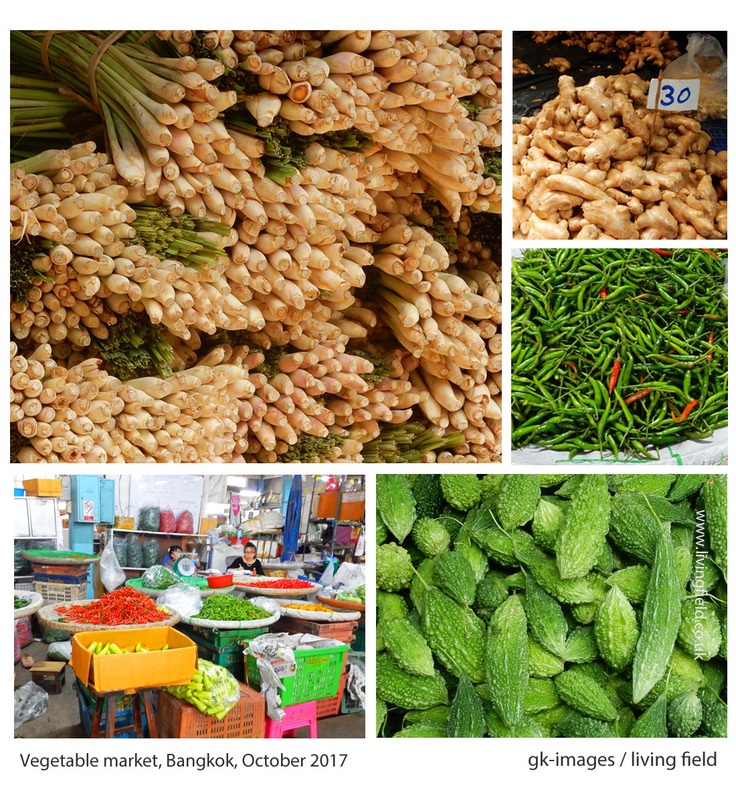 Links on this web site to vegetable markets include 2 Veg to Pellagra (Carcassonne and Burma) and Inle Lake Burma. Taro Colocasia esculenta is not so appreciated in Europe, but is a staple of village subsistence throughout south-east Asia. It is close taxonomically to Arum maculatum, the lords and ladies of the cropland’s hedges and shady corners. For more on taro intercropped with ginger and chillies in Burma (Myanmar), see Mixed Cropping in Burma at curvedflatlands. Note the Latin name esculenta has been used for centuries in Scotland – in the form ‘esculent’ – to refer to tuber crops, including potato. For reference and source, see SoScotchBonnet on this web site. 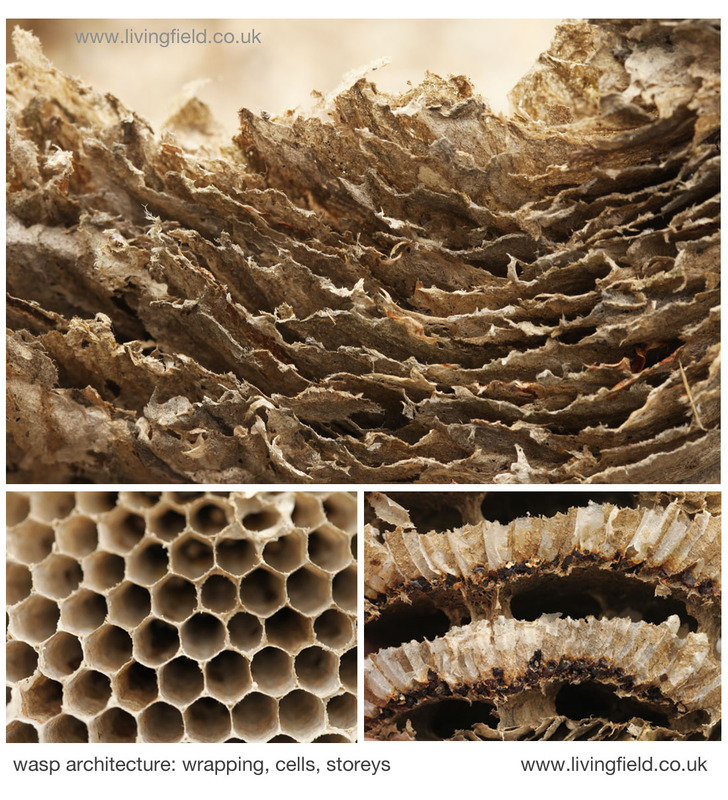 Thanks to gk-images for the photographs in the first two panels above. 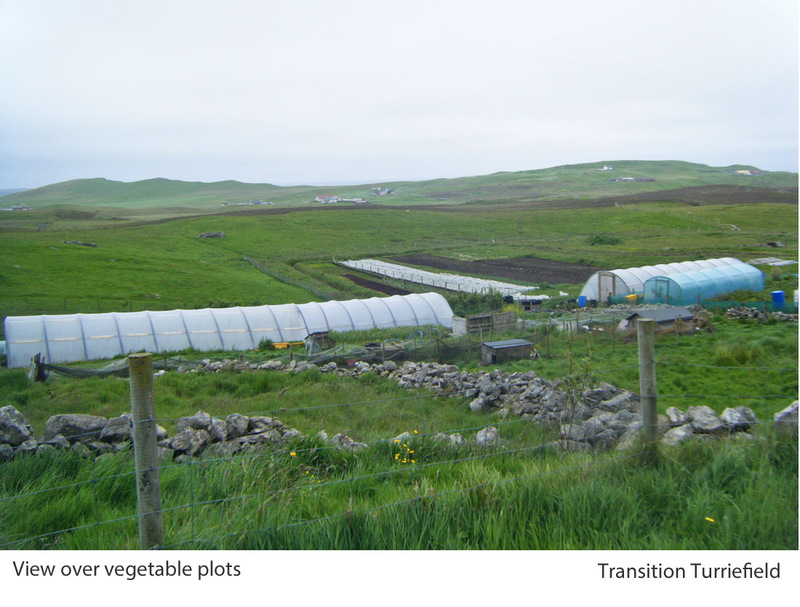 Transition Turriefield – vegetable production in Shetland. Can we grow more vegetables? 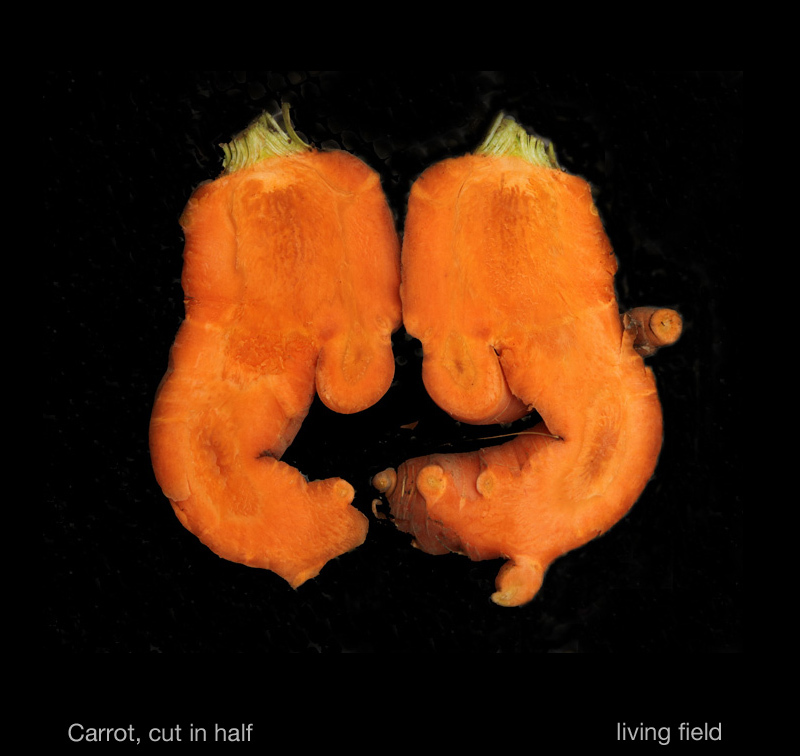 – the vegetable map of Scotland. Vegetables in the Living Field garden: Garden/vegetables and the Garden’s vegetable bounty. 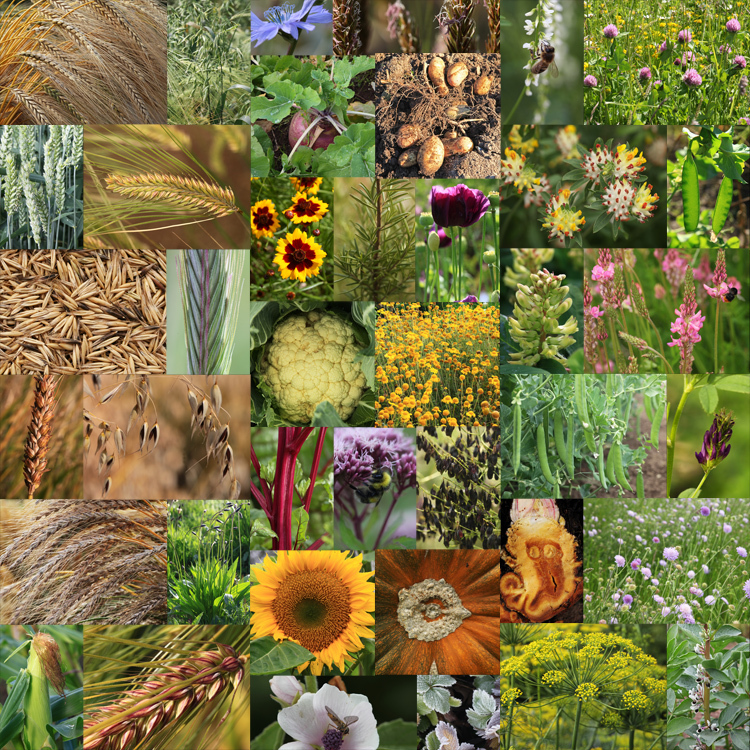 A vegetable bounty this year – leaves, flowers and ‘roots’ of all shapes and sizes have appeared in the Living Field Garden. Gladys and Jackie have nurtured a fine array of eatables, which many long term Garden observers say is the best yet, and that’s from a year which has not been ideal for crops. Here are just some of my favourites (writes Geoff). This red cabbage (sometimes called blue) matured late and kept well, outside in the shade, for at least a month after being cut. Half was pickled, and sat on a shelf with the others. The rest was eaten as a raw or cooked vegetable. 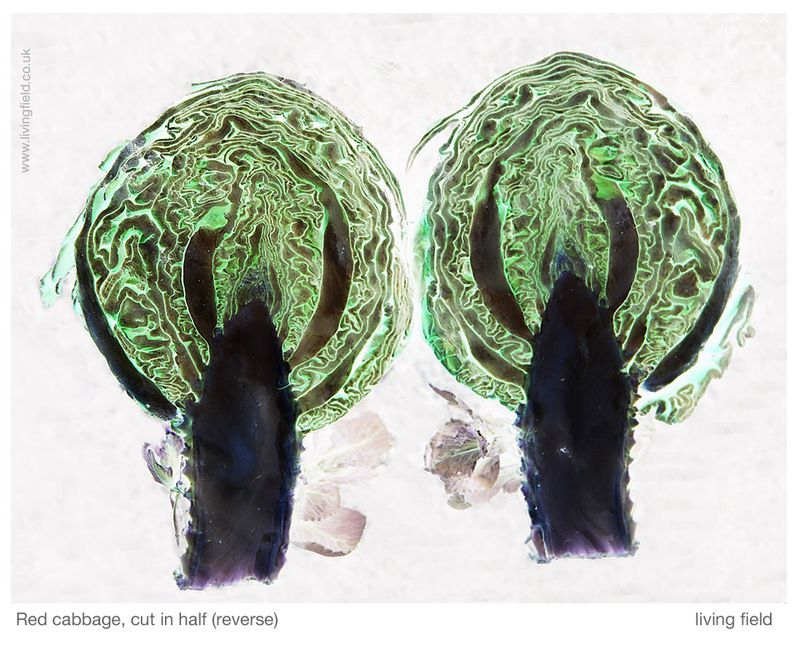 The cabbage shown above was cut in half with a big kitchen knife and photographed. 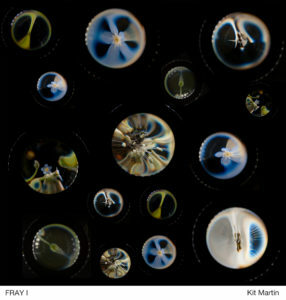 It is shown as a ‘reverse image’ to bring out the structure of the folded leaves. 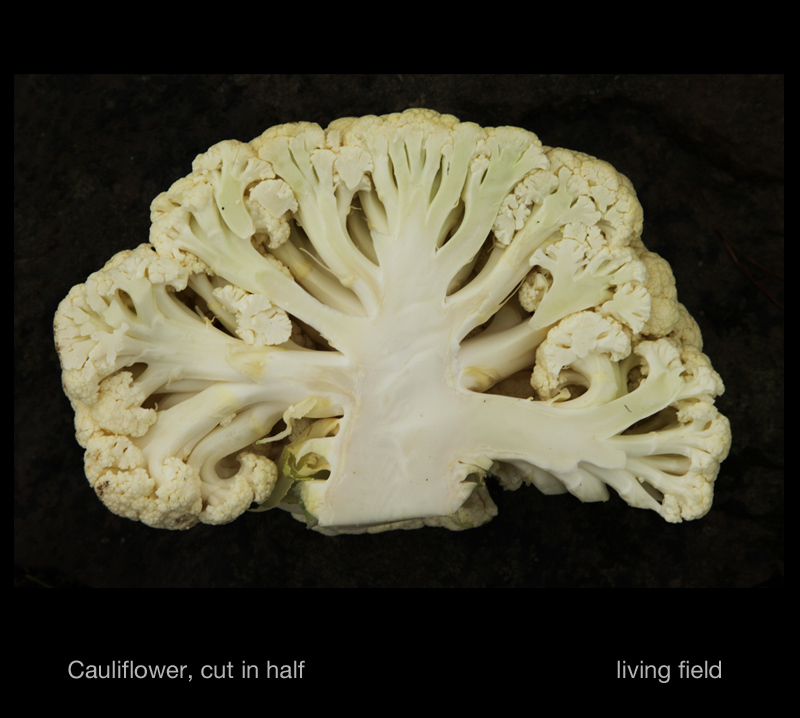 The cauliflower, below, was football sized and too large to show its halves side by side. One half went the same day as it was cut, eaten as cauliflower cheese – a strong brassica taste with a milder cheddar-type cheese sauce, in this case Mull (but Anster is also good for this), sprinkled with grated parmesan, and then paprika to give it spice and colour. The other half was cut into small pieces and pickled with wine vinegar, onion seed and peppercorns, to be eaten over the winter. It is now waiting in a jar. The carrots (below) grew into complex shapes this year. They are not deformed, just natural. Some of this year’s carrots looked like an octopus, orange tentacles clasping the main body. Others reclined languorously on the table top, waiting to be peeled and cut. Still others were more or less straight with lumps in strange places. But there’s no reprieve whatever the form. Roasted or boiled with herbs, very tasty, real carrot, soon eaten. 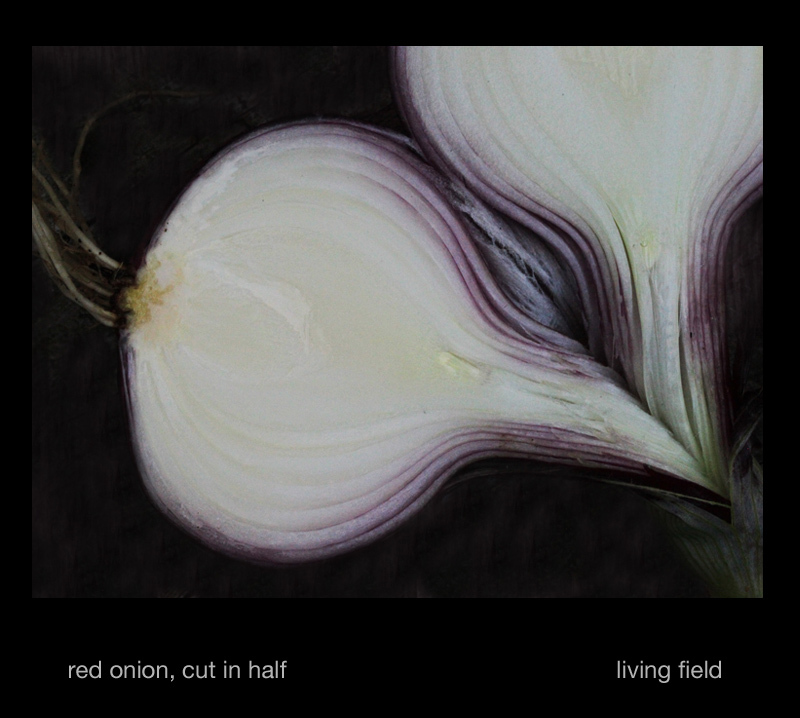 The onions looked a bit ragged on harvest, but were unblemished inside their protective leaves. The smell when cut is definitive, to be savoured and remembered. The layers of leaves, filled with winter storage, are distinct, all white near the centre but with red outers towards the edge of the bulb. The onions that came to our kitchen from the garden this year were all pickled with seeds and spices in wine vinegar. They are also waiting in a jar, next to the cauliflower. The beet went the same way as the cauliflower – one half pickled, this time in red wine vinegar, the other half eaten. But the revelation for me – not a great fan of beet – was the chunks of it, coated in oil (try cold pressed rapeseed) then roasted in foil and eaten with Maris Piper. What a taste – fresh cooked beet like this is up there among the great vegetables of all time. Thanks to those pioneers of crop selection who managed to get these red chunks out of wild sea beet. You can see more of Gladys and Jackie’s efforts on display at Open Farm Sunday 2017 and at Vegetables on the Garden pages. Following a trail ….. starting with a blues song – cornbread, peas and black molasses – sung at the Dundee Jazz festival – and on to chain gangs, slavery and rural poverty, and the peculiar malnutrition caused by a maize-based diet, appearing as the debilitating condition pellagra, and then on to the discovery by Joseph Goldberger that pellagra was not an infectious disease but a dietary deficiency, a shortage of bioavailable niacin ….. and this trail leads to the question of what happens when maize became the staple diet, or at least a major part of it, as the crop spread to Asia and Africa from its origin in central America. 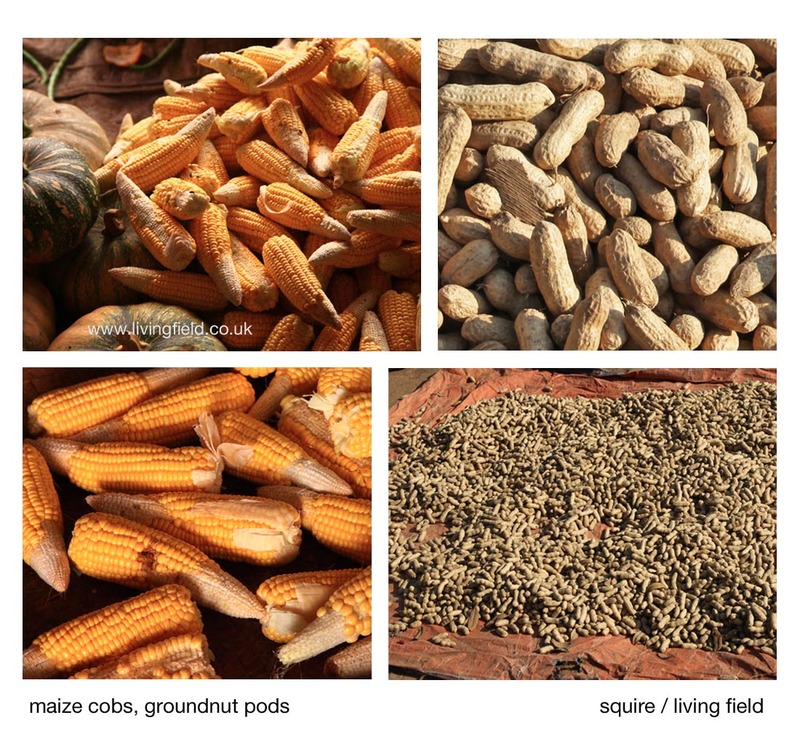 With maize Zea mays as the main corn (grain) and carbohydrate, there has to be other food to provide the missing vitamins – food such as groundnut Arachis hypogaea (usually named peanut in the UK) and other high-protein pulse crops, and fresh green vegetables. And it’s noteworthy that in parts of the tropics, maize is often grown along with pulses such as groundnut, and not just as patches side by side but in intimate mixtures, named intercrops when the two are grown in rows. The spatial arrangement of the two crops probably matters little for the balanced diet, but the combination, when in rows as in the image above, increases the yield on at least one of them. So there are two products – maize and groundnut (peanut) – which together provide much of a healthy diet, and they yield more from an acre of land if grown together. The groundnut-maize intercrop shown above was on the margins of the Irrawaddy river in Burma, probably growing on stored nutrients and water left behind as the river receded during the dry season. 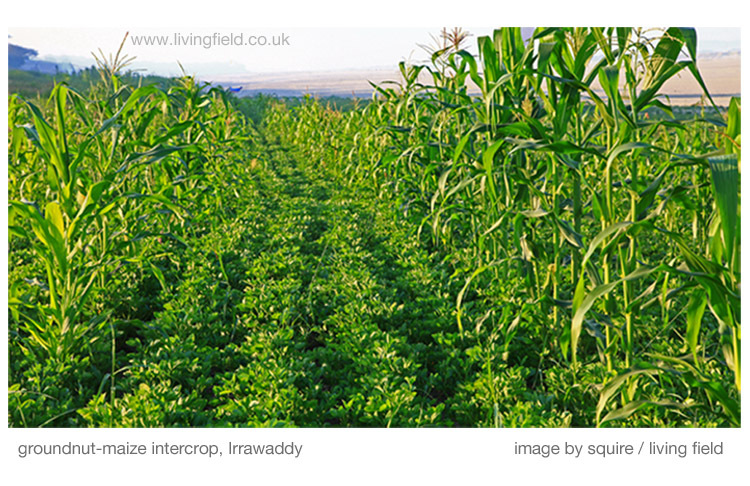 This example (and there is no one way to grow the two crops together) looked like a long thin ‘field’ of groundnut into which maize was planted in every fifth row. Research elsewhere on groundnut-maize intercrops shows that in this configuration, the maize yield is ‘free’ or extra, in that it does not suppress the yield from the groundnut. The images above show maize cobs on sale at a local market and a groundnut harvest spread out in a cloth in the sun to dry. Each pod contains three or four seed (the ‘nuts’ in peanut). A month or two earlier, they were on the plant, but unseen, buried just under the soil, an amazing adaptation that helps to protect the plant’s seeds while they fill and mature. There are other ways to get essential vitamins in a maize-based diet, but the maize-groundnut mixed crop offers much towards a balanced diet and gets more from the environment than either crop grown alone. The article Mixed cropping in Burma gives more on crop mixtures, and scientific reference to pulses.